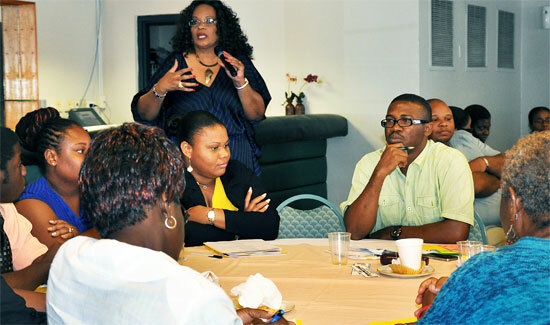 The Bahamas Hotel & Tourism Association (BHTA) in collaboration with the Ministry of Education, Science and Technology (MOEST), the Ministry of Tourism (MOT) and The College of The Bahamas’ Culinary & Hospitality Management Institute (CHMI) hosted the 11th Annual Educators’ Industry Internship Programme this summer. Jerome Fitzgerald, Minister of Education, Science and Technology addressed the eighty (80) participants during the closing ceremony, under the theme, “Teachers Meeting the Challenge to Bring about the Change”. Minister Fitzgerald noted the past decade of success of the Internship Programme. He said that the programme has rapidly become the way forward to broaden the awareness of educators, so that curricula becomes more relevant and instruction more beneficial to students who wish to pursue careers in Tourism and Hospitality. The Minister said that there must be a commitment to collaboration from all stakeholders to facilitate the continued success of this professional development initiative. He encouraged the educators to use every opportunity to immerse their students in their subject content through hands-on experience learning. * Commitment by the Ministry of Education, Science and Technology and BHTA to work together to establish a Tourism BGCSE. The Minister said that when these goals are achieved, the Tourism and Hospitality Studies career options should attract the interest of more of our students as they recognize the diverse offerings that are available. Khalile Francis, a Science Teacher at L.W. Young Junior High School said that he is motivated by the level of professionalism and teamwork that he saw displayed during the programme. He stated that he will encourage his students to embrace the change that is necessary to become successful in the area of Hospitality and Tourism. A recent College of The Bahamas graduate, Kirkland Charles will be entering the teaching profession as a Family and Consumer Science Educator. Mr. Charles pointed out that it is important for teachers to know how the industry works so that they can share this information with their students. “Our students look to us for knowledge, therefore, we must have the insight to answer their questions”, he said. Ms. Shantell Johnson, a Teacher at C. W. Sawyer Primary School also participated in the internship programme for a second time. She said that she believes that children should be encouraged to think about career choices from an early age. Ms. Johnson shared that children can learn the importance of good interpersonal skills, good manners and teamwork that would be beneficial if they chose a career in Hospitality and Tourism Studies. She recommends that teachers participate in the programme because in her view it was an excellent workshop and a great learning experience. Ms. Samantha Cartwright of the Ministry of Tourism’s Training and Education Department Schools Unit stated that she was delighted to attend the internship session for a second year. She enjoyed working in the Front Office and Guest Services and appreciated the hands-on approach of working with tourists. Ms. Cartwright said that educators must stress to students that every job done has an impact on the outcome of a visitor’s stay. “Tourism is our number one industry so we must do our part to keep it so”, she said.